They feed Bolivia but are neglected by current gov?! WTH? Of the $30 million dollars for large producers, no disbursements were made yet. Livestock restocking program and infrastructure improvement in Beni has two realities. The first is that for small farmers and affected communities, the government gave $7 million dollars of the $15, the second is that of the $30 million earmarked for large livestock not a single penny was spent, a situation that generates discomfort and makes farmers ask Government to greater fairness in delivering resources. 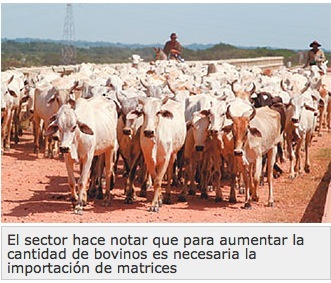 Mario Hurtado, president of the Federation of Livestock of Beni and Pando (FEGABENI), lamented that only one sector is addressed and that the one which feeds Bolivians, the one which holds bovine supply is not addressed the same way. Hurtado said that in the last flood, Beni lost more than 300,000 calves and so far not one of them was replaced. “There are 400 submitted portfolios, but those affected are over 7,000 people, so the outlook is not very encouraging,” said Hurtado. In this regard, Nemesia Achacollo, Minister of Rural Development, said that they are working with small producers, but did not specify how the program is for large farmers. In the office of the Eastern Agricultural Chamber (CAO), the productive and private secotr met with Achacollo, with the aim of setting workshops and see the needs of each sector. Julio Roda, president of CAO, said during the week that will shape the working groups for the Monday or Tuesday [08/19/2014] of next week, a technical advance report on the needs of livestock farmers, grain producers, poultry and private entrepreneurs and at the same time, a response to these demands be achieved. It is jus infuriating to see the ineffectiveness of current ochlocracy in government! No wonder that similar “style” like the ones in Cuba and Venezuela are starving their population. This entry was posted in Beni, Bolivia, Business, Economics, Politics, Santa Cruz, Social Unrest and tagged bad politics, CAO, demagogue, livestock, Ochlocracy, public policy failures. Bookmark the permalink.